"The president of the LDS Church passed away Sunday evening at the age of 97. 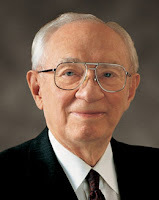 Gordon B. Hinckley was the fifteenth president of the church and has been president since 1995. He was the oldest person to preside of the church in its history." I just can't believe it. Because I joined the church in 1995 he has been the only president of the church I have known. I saw him speak at a regional conference just a few months ago. Of course we all knew he was getting older and that this would likely happen soon, but it is still a shock. He will be missed but I'm sure he is having a beautiful reunion in heaven with his dear wife who passed away a few years ago. I'm in shock, too. I have so many mixed feelings about it. I know I will be happy for him and the reunion he is having in Heaven, but right now I am sad and in shock. This is heartbreaking. The reunion with his wife and the Savior though, that I know must have been incredible. Such a wonderful man. I will sure miss hearing him speak during general conference. He was always so optimistic.